Today was without question the most exciting day so far of my linguistic tour of northern Spain with my friend Sue. 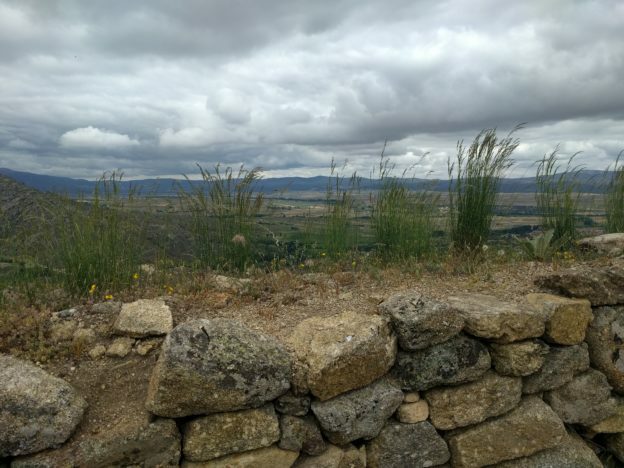 We picked up a rental car in Madrid and drove west by northwest to Ávila, then southwest to Ulaca, the ruins of a fortified Celtic hill-town, or castro. Ulaca was on our itinerary because the Celts were one of the most important pre-Roman peoples in the Iberian Peninsula. They left their linguistic imprint on both Spanish vocabulary and toponymy (place-names). Spanish words of Celtic origins include álamo ‘poplar’ and serna ‘plowed field’; Celtic place-names include Segovia and Lugo. I can’t recommend Ulaca highly enough. You need a car to get there, and you need to be in decent shape for the climb, but the ruins are fascinating, the views are beautiful, and the combination of granite rocks and purple and yellow wildflowers is unbeatable. The slideshow below tries to share some of the excitement that Sue and I felt today. It also has practical information about how to get to Ulaca and where to learn more. This entry was posted in Linguistic tour of northern Spain and tagged archaeology, avila, celtic spain, celts, hill-fort, iron age, pre-roman spain, ulaca, verraco, vettones on 17 June, 2016 by jhochberg.